I took my co-blogger’s advice and found something to celebrate this week! I took Wednesday, September 23rd, Yom Kippur, the autumnal equinox, the first day of Autumn and I am sure somebody’s birthday, off. Well, at least half the day anyway. And I convinced most of the members of my family to take the day off too. 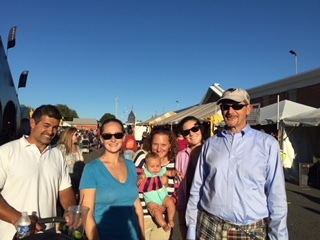 We all headed to the Eastern States Exposition (The Big E) converging from our separate locations on West Springfield, Massachussetts. Unfortunately, many other people-not-celebrating-Yom Kippur decided to go to the Big E too. Being pros, Jess and I avoided most of the huge amounts of traffic — that much more insidious since it was unexpected on a weekday. Some of our family members, however, were not as lucky, and it took them twice as long to get there as it should have. 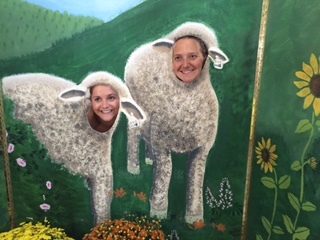 Our afternoon at the New England States’ Fair was filled with cows, butter sculptures, pig races, eating our way through the state’s buildings, appliance demonstrations at the Better Living Center and lots of logistical challenges. But primarily, it was filled with joy. The joy of being together, A caveat – that joy is never unmitigated! The joy of being together also brings the un-joy of waiting around while someone lingers at the Chamois demonstration or wants to look at the farm equipment when no one else does. And it also includes the joy of getting separated and having to spend time on the phone trying to locate each other. Logistical hassles aside, it was a beautiful afternoon, sunny, warm but not hot, with lots of things to see, too many temping things to eat and the happiness of being together enhanced by the memories of Big Es in the past. We have had so much fun over the years at the Big E! 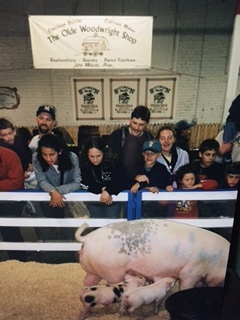 Showing our children and their friends the livestock; connecting what we eat with the prize harvest and the prize livestock displayed by the New England 4H Clubs. The cute little piglets nuzzling and nursing their fat mother dramatically made that important connection between animals and the food on our table. My kids and their friends saw that all food comes from somewhere, at a cost of life and labor and should not be wasted. This year we took a new friend from Great Britain, Charlotte, who had never seen anything like a state fair. Munching on kettle corn, I looked at the fair from her perspective and enjoyed it anew. Two dollars bought ice cream from the Friendly’s booth piled high in a cup. It slid deliciously down my throat as I watched several marching bands perform old favorites in the parade celebrating Connecticut Day. 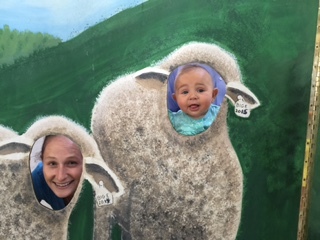 Charlotte really got into the swing of things; bought lambswool slippers and slipped into a lamb cutout with Jocelyn. The circle of love is ever expanding. 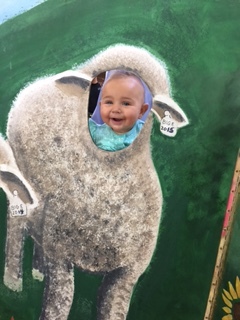 Every year for the past thirty-five years, my trip to the Big E is my reminder to cherish our newborn baby lambs.